The default workbench of Sonargraph is divided into 4 regions. 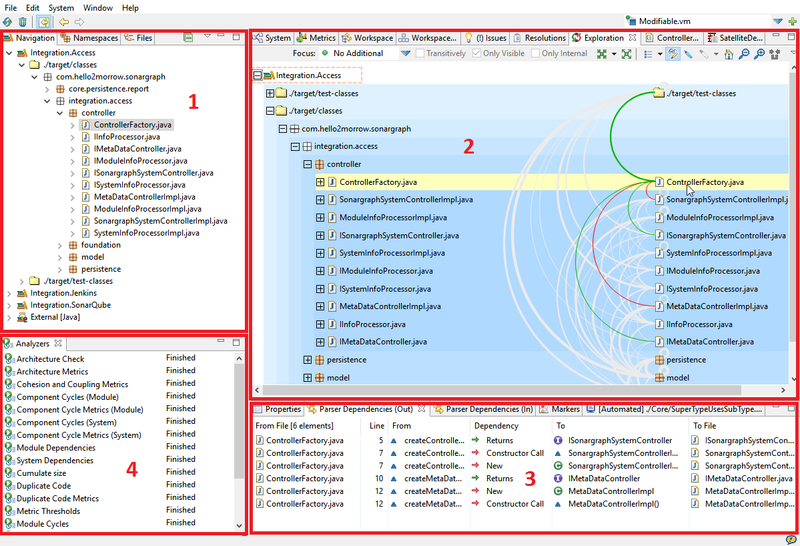 However, as Sonargraph is built upon Eclipse's Rich Client Platform you can always re-arrange views as you like. Collapse All : Collapses the whole tree of elements. Link : Selecting it specifies if the selection in the current Master view should be synchronized as far as possible with the selection in the currently selected Slave view. The Navigation and Namespaces views offer a "View Menu" option which can be used to specify whether the elements of the tree are to be displayed in a flat mode or in the hierarchy induced by their dot-separated full paths. Exclusive to the "View Menu" option of the Namespaces view is the possibility to choose between system-based or module-based representations. Slave views: Located at the upper right hand side of the workbench provide ways to manage and explore the components of the system under consideration. The slave views have the capability of responding to selection from the master views. Auxiliary views: Located at the lower right hand side of the workbench, provide support to some of the slave views to expand their system exploring capabilities. Information views: Located at the lower left hand side of the workbench, they provide general information about the properties of the selected elements and the status of the analyzers running over the system model.